The first thing you need to ask yourself is what type of PSP to do you have? - All PSP 1000s are currently hackable. Next, you need to understand the basics of hacking a PSP. When people say they have "hacked" their PSPs it means that they have modified the firmware (the operating system the PSPs use) on it to a certain firmware called "Custom Firmware" or CFW for short. CFW is modified Sony-made firmware so that you can run homebrew (user made programs) and copies of UMD games stored on your Memory Stick as ISOs, as well as old games via emulators. 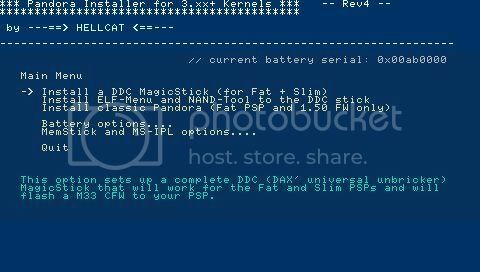 Custom firmware retains all the features of Sony firmware and adds more (such as the capabilities I have already stated). There are two types of Custom Firmware floating around at the moment: one is called M33 by Dark_Alex of Team M33, and one is called GEN by the GEN team. GEN firmware is current and is updated frequently, M33 hasn't been updated for a long time and doesn't support current games. This guide shows you how to load GEN firmware. - Once finished, go (on your PSP) to Game > Memory Stick. - Choose "I AGREE, now take me to the program!" - Choose "reset (format) settings as well"
Last edited by Scorpus; 10-16-2010 at 05:49 PM. 4) Disable USB Mode. If you use a CTF/PTF, go to Settings > Theme Settings > Theme > Original. Turn it off or the installer wont load for you. 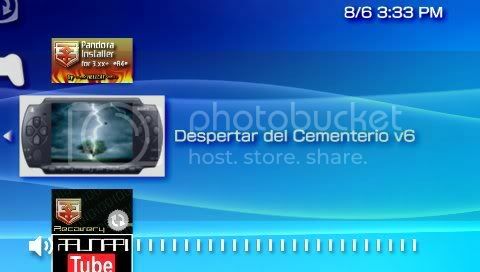 5) Launch Despertar Cementerio from Game > Memory Stick. 6) Once it loads, you will have to press X to begin installation. 8a) If you are using TimeMachine you will be prompted to press a button at the end of install so you can launch DCv6. Any button that doesn't boot any other firmware is good. (I use D-pad up). Hold whatever button you want to until the installer reads it and carries on with installation. 9) You now have a Magic Memory Stick. Continue to learn how to make a Pandora's Battery. 10) Go into the Hellcat folder and move the 'pan3xx' folder to X:/PSP/GAME. 11) Go into the Update 150 folder and copy the UPDATE.PBP to the root of your Memory Stick. This is necessary. If you don't do this step, Hellcat's Installer will fail to work for you..
12) Launch the installer, and go to 'Battery Options', and then go to 'Dump battery serial to file'. Afterwards, go to 'Make Battery Pandora'. Once done, exit, and you will have a working Magic Stick and a Pandora Battery. 1) Go into the Hellcat folder and move the 'pan3xx' folder to X:/PSP/GAME. 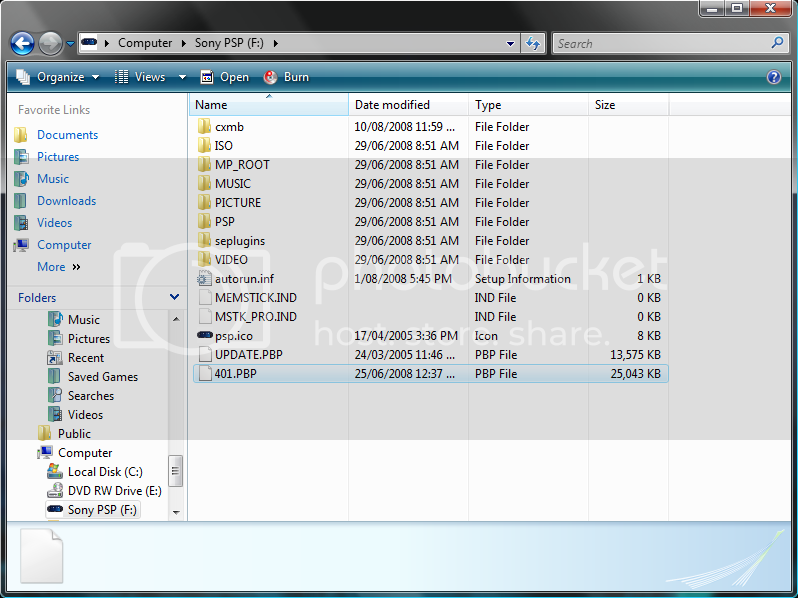 2) Go into the Update 150 folder and copy the UPDATE.PBP to the root of your Memory Stick. This is necessary. 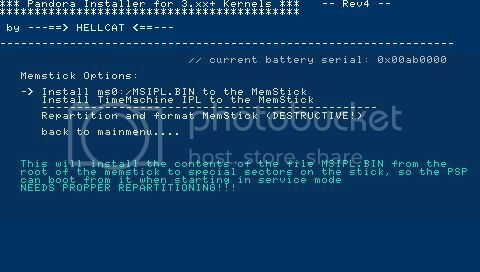 If you don't do this step, Hellcat's Installer will fail to work for you..
Last edited by Scorpus; 08-23-2010 at 06:49 AM. Understandably you may not want to bother with making a Pandora's battery (below) If so, then you can purchase a Pandora's Battery from DealExtreme for US$6.32 and it should ship pretty much anywhere in the world. If you don't want to spend any cash (understandably), look below on how to make a battery. The battery that is guaranteed to work for the Pandora process is the standard Sony battery. The fat batteries look like this (the Slim ones are similar), and I recommend using one over cheaper alternatives. 2b) Slim batteries also have this chip, but it is located in a different position, and the method to lift pin 5 is different. 4a) Now is actually desoldering the pin. There are a few ways you could do this, but I think my method is the best because its less likely to damage components near by. Use an Xacto knife with a sharp tip and try to put it underneath the pin. Get somebody to hold a soldering iron (WITH A VERY FINE CONICAL TIP!) on the pin. When the solder melts you can pop the pin up with the knife. Be sure not to hold the iron on the board too long to avoid the lithium battery from getting too hot and exploding. 4b) In the picture above of the Slim battery you will notice two circles. You could follow the method above if you like and cut the pin in the red circle, but there is an easier method. Just cut the trace in the blue circle with a knife and it will have the same effect. 5) Finally, you'll need to close up the battery case. You can use glue or tape to do this. If you desoldered the cell pack it is recommended that you resolder it. 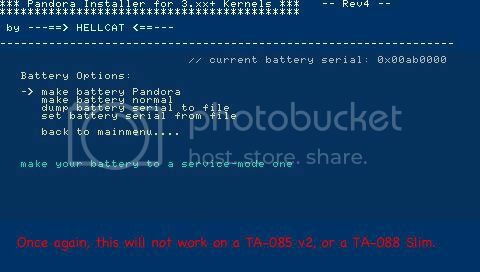 How does the Pandora's battery work? The pin that we just lifted was actually the ground pin of the EEPROM. Removing this pin effectively shuts off the EEPROM. When the microcontroller inside the battery tries to read the EEPROM, it will think the EEPROM contains all 1s (in binary). This is because of the pull-up resistors on the data lines. So the microcontroller returns a serial number of 0xFFFFFFFF to the PSP, which then goes into service mode. Note: The Pandora's battery will no longer function as a normal battery, and you will need to either plug in your AC charger or buy/find a new battery for playing games after the hack is complete. Last edited by Scorpus; 12-28-2009 at 09:29 AM. Last edited by Scorpus; 08-23-2010 at 06:50 AM. NOTE: If your PSP shuts down during your installation (or you remove the battery or something), your PSP will be bricked. Don't worry, just take out the battery and put it in again and DC will load and you can try to install Custom Firmware again. If your PSP is bricked, you can also use the battery to unbrick it. Last edited by Scorpus; 02-06-2010 at 10:41 PM. Last edited by Nothingface420; 10-20-2008 at 08:25 PM. Thanks Scorpus, Great guide, Repped! BTW, you mentioned that you can tell if a PSP in unhackable by looking at box(?). I read you guide several times but I can't see the part that can tell me if a PSP inside the box is unhackable or not? Can you tell me please? Also, seems like most of the PSPs on store now probably have the new Mobo and firmware, so are we SOL'd? or will there be a hack for TA-088 Mobo in the future? Scorpus until i get 1.0 updated add a note in there for vista users to right click and run as admin.